A small trial suggests that a vaccine against Ebola could protect gorillas and chimps from the deadly disease. 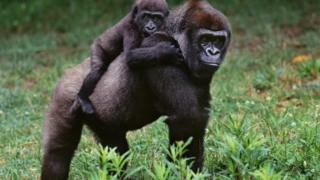 Past outbreaks have devastated great ape populations, particularly gorillas, where the virus is estimated to have wiped out a third of the primates. A scientific team now says that wild gorillas could be vaccinated to protect the critically endangered animals from further losses. However some conservationists warn that this would be difficult and has risks. Dr Peter Walsh, from the University of Cambridge, who led the research, told BBC News: "Now that we have shown this is a safe vaccine, it's really a moral imperative that we use it. "The disease is a huge threat to gorillas right now. We vaccinate our children, we vaccinate livestock, we vaccinate our pets, we vaccinate wildlife - why aren't we vaccinating our closest relatives?" The outbreak of Ebola in West Africa that started in 2013 highlighted the devastating toll that the disease can have in humans: more than 11,000 people are estimated to have died. But now there is a vaccine that has been shown to be 100% effective against the disease, and the hope is that it will prevent anything on this scale from happening again. Some scientists say gorillas could benefit from immunization, too. And Ebola in humans and great apes is closely linked. Many human outbreaks have started after people came into contact with infected gorilla or chimp carcasses or bushmeat (the 2014 outbreak is not thought to have started this way but instead through contact with Ebola-carrying bats). The disease is extremely deadly for our primate cousins: if chimps or gorillas are infected, there is a 90-98% chance that they will die. Many thousands of gorillas, which are also facing threats from poaching and habitat loss, are thought to have died from the disease. "There are whole areas, hundreds of kilometres in every direction, that have just been wiped out of gorillas," said Dr Walsh. To see if immunization could help, a vaccine was tested on 10 captive chimpanzees at a research centre at the University of Louisiana Lafayette in the US. Because chimps and gorillas are so closely related, the researchers assumed that if the vaccine worked in chimps it would work for gorillas also. Six animals were given the drug by mouth and four were injected with it. "We found the vaccine gave a very robust immune response and didn't cause any health complications," said Dr Walsh. Dr Walsh acknowledged the trial was small, but said it was stopped early when a ban on the use of chimpanzees in biomedical research came into force in the US in 2015. He added that most other parts of the world either have moratoriums or bans on great ape research, and said that sanctuaries and zoos were either unwilling or unequipped to carry out trials. "Effectively, we just have to start doing it in the wild now," he explained. He wants to see if lacing sweet treats with the vaccine or using remotely operated sprays or darts could help to immunize wild animals. He is also looking at how to ensure the vaccine remains effective and stable in the heat of the forest and wants to further examine the dosage. Liz Macfie, vice chair of the International Union for Conservation of Nature's section on great apes, said that the results of the trial were encouraging and promising. But she told the BBC that rolling out a wider vaccination programme would be difficult. She said: "Some wild apes are habituated to tourists or researchers' presence, so some you can approach. But the majority of the populations are completely unhabituated and it would be very difficult to provide a vaccine into a group of unhabituated apes." She also said there were some concerns about safety. "There's always the risk when you use a vaccine on wild animals that there is an associated pathology or infections that might spread… It's a small sample size that [this vaccine] has been tested in and we don't really know about all of the other effects." But she added that conservationists now needed to come together to look at studies like this and assess the best way forward. These thoughts were echoed by Sarah Olson, associate director of wildlife epidemiology for the Wildlife Conservation Society. "An oral vaccine formulation would need to be stable and edible, as gorillas are really picky eaters, safe for target and non-target species impacts, and effective and affordable," she said. "There are other vaccine approaches under consideration but they will all require more research." However, Dr Walsh told the BBC that the situation was urgent. "The Ebola situation is quiet right now in Africa, and there is a danger that people are going to think: 'Oh, that's not a problem anymore, we don't have to worry about it'. "But believe me, it's been quiet before and then it's come roaring back. "And that's why, instead of waiting for the crisis, we need to start to develop the tools to protect these animals in the future." Ebola and ethics: Is animal welfare killing wild apes? Scientific Reports: The Final (Oral Ebola) Vaccine Trial on Captive Chimpanzees?